With just four days until baby's due date, it is surely time to have all the things packed and the details in place. Truth be told, we've had our bags packed since 37 weeks just in case this little lady decided early was more of her speed. Turns out, it's not. But, it has felt really nice to be prepared and ready just in case, taking some of the unknowns off of our plates as we wait for this girl's arrival. So, what are we bringing this time around? Mostly, the same items we felt compelled to pack the first time. But, what I did learn from baby #1 to baby #2 is to take some items that feel more like you're pampering yourself. What I mean, is that as a first-time mama I didn't think to pack pieces that would make me feel put together and pretty. I didn't want to be cliché about it, so I packed the old pajamas, a basic robe that I don't remember even wearing, etc. While there's nothing wrong with taking some of your well-loved and comfy clothing, there's a lot to say about taking a few items that are a bit more special. So this time around, I'm doing just that and bringing some pieces that are going to help me feel a little extra put together and, dare I say fabulous, after birthing baby. First, let's talk bags! Over a year ago I came across Lyla Grace Design. She makes a variety of customized canvas totes for any and all ocassions. 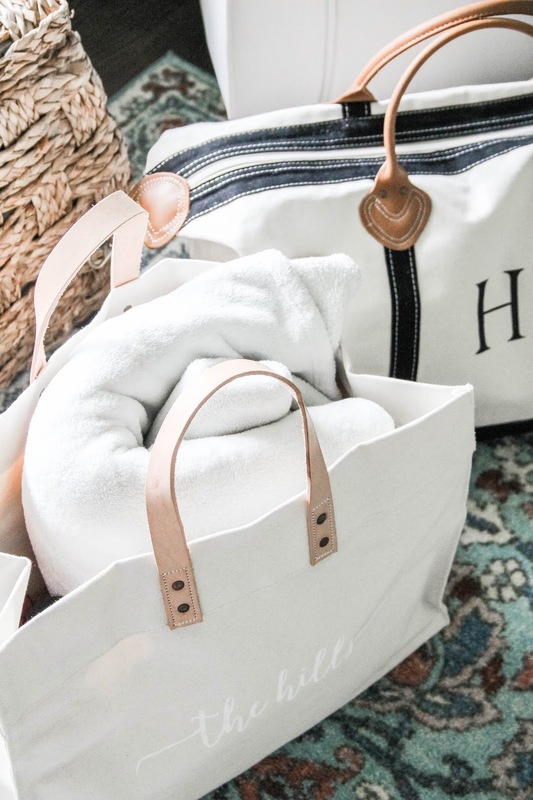 I immediately fell in love with her monogram duffle bag, which is a great weekend bag. The second bag that had me swooning was the monogram box tote with leather handles. Not only is this bag exceptionally functional (it stands all by itself! ), it's also a statement piece that I use as a decorative item in my foyer when I'm not using it. 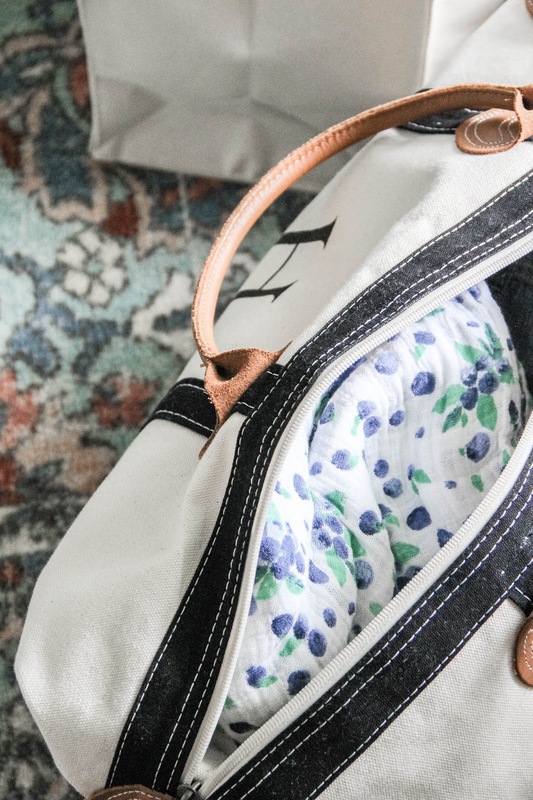 This bag is superb for trips to the library, picnics, little adventures, etc. Both bags (and there are more options on her site) are customizable with names, monograms, sayings, etc. You just have to ask her! We'll be using the duffle bag (my husband and I each have one) for our clothes, baby's clothes, and our toiletry bags. The box tote will be used for our more random things like snacks, a blanket, our camera, and so on. And instead of worrying with a purse and diaper bag for the hospital, I'll be using my large canvas tote for those items. 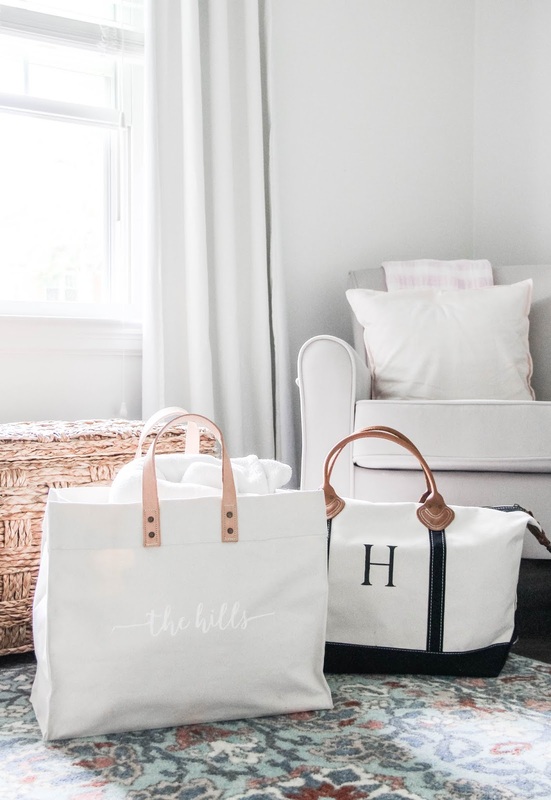 These bags are a beautiful way to take personalized items to the hospital while keeping all of the essentials together! Now on to what we're packing in those bags! Having a feminine robe with sweet trim detail is going to be so nice to have for nursing and wearing during our stay at the hospital. It will be my little bit of fancy for a not so fancy place and give me a pretty way to cover up when we have visitors/are taking keepsake photos. While I have some pajama tops that would work just fine, I wanted something new and fresh to pack for sleeping. This basic top is nursing-friendly and super comfortable. Sometimes it's the simple things that can make you feel great. Greer had a special swaddle, which we ended up using for her newborn session. At the last minute this time around, I decided that having a special swaddle for the hospital was important to me too. After going back and forth on two swaddles and which we would want to use for newborn photos, I thought the option we didn't opt for was great for taking to the hospital for those sweet photos! This time, I ordered a dress (just a basic and simple one) for wearing home from the hospital. You're still toting a belly and you've just undergone a major milestone (hello, birthing a human!). So I wanted something that would make me feel pretty for leaving and arriving home. This will also be an outfit I can use for nursing since it's billowy and isn't maternity, while also being flattering during those transition months after baby is born and your body is finding its shape again. In my book, comfort is everything. So I snatched up some new bras that were my favorite while nursing Greer. The elastic is firm and the fit is great while also being cozy. Can't beat that! Most likely I won't need the cloth pads just yet, but I'm brining some to have on hand in case. Even in the summer, socks with grips are great for getting up and moving, especially after a c-section. This way, your feet are covered on those hospital floors and you can move around when needed. It feels so nice to transition from a hospital gown into your own clean clothes that have easy access for nursing. I mentioned the top I'm brining this time. And here is a nightgown option I love too. We'll have this swaddle and this swaddle, along with a little thicker blanket since hospitals are cold! We are taking some to have on hand even though the hospital will put her in one. We have long sleeve and short sleeve options packed. And then we'll have a nightgown for her for nostalgic reasons since big sister wore the exact same one after her first bath. Because those baby nails are sharp and we want to protect her sweet little face from scratches. And we want to keep her cuddly and warm. We have some matching sister bows that I can't wait to have both of my girls in! Having several options will be great for pictures too. For keeping that sweet, little head warm, we've got this cute cap packed and ready. It will match one of her swaddles. I have an assortment of pacifiers that we have sanitized and packed in case they are needed. I use some cloths my friend made me + these. We are packing a couple in different sizes so we have something no matter how big or little she may be. **A tip to keep in mind. We packed everything that we could ahead of time, but for those items that we use daily, we have a running list on husband's phone that he is in charge of grabbing when it's go-time! This way we (hopefully) won't forget anything and we aren't trying to think of what we still need to grab when our minds are on getting to the hospital! **Affiliate links were used in this post. Thank you for supporting Darling Do!